A couple of years ago, I would spend hours lost on YouTube watching players run through seemingly impossible user-created Super Mario Maker levels. The difficulty wasn’t realized in traditional ways (beat an enemy, get to a goal) but instead relied on often sadistic levels of precise movements to complete. Players were supposed to get hit by a shell or bounce off of Yoshi falling into a pool of lava, and had to do it all perfectly just to land on a very specific platform for a split second before moving on to another area. 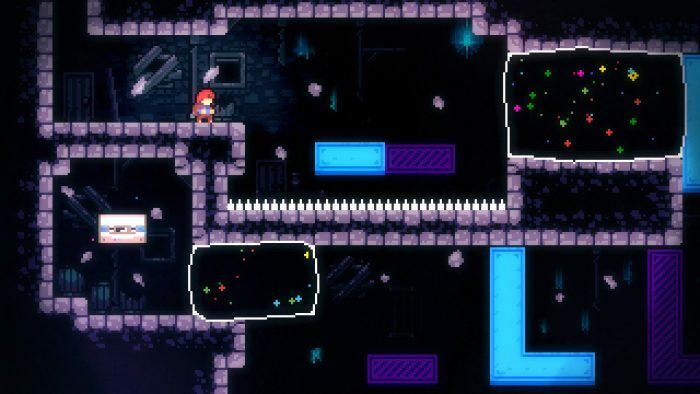 Celeste follows those same tenets of challenging, often brutal level design, but manages to succeed where all of those fail by teaching us rather than showing. The 2D game follows the story of Madeline, a hiker who awakens mysteriously at the base of Celeste Mountain. Her internal compass prompts her to climb upward, though she doesn’t know why. Madeline’s method of climbing involves jumping, scaling walls and air dashing, and though the moveset itself is basic, it’s the combination that requires mastery. In fact, it acts more like a rhythm game at times, demanding that we move our fingers in unison as we conduct a platforming orchestra. It feels terrific mechanically, with smooth and natural movements. There is zero luck involved in Celeste; it’s a game that necessitates high skill levels and accuracy. Thankfully it’s a wonderful teacher, too. Developers Matt Makes Games have put incredible emphasis on the pacing of the game. The challenge ramps up quickly, but the screens are never too long where we get overly frustrated. Instead they’re just long enough, affording us the ability to learn and become better for each situation. Failing becomes a part of that learning process. It’s common to die hundreds of times within a stage, just trying to solve one area or jump, until we nail it and nail it consistently. Once we figure something out, we don’t forget it, and instead add it to our arsenal of tricks and methods to use later on. 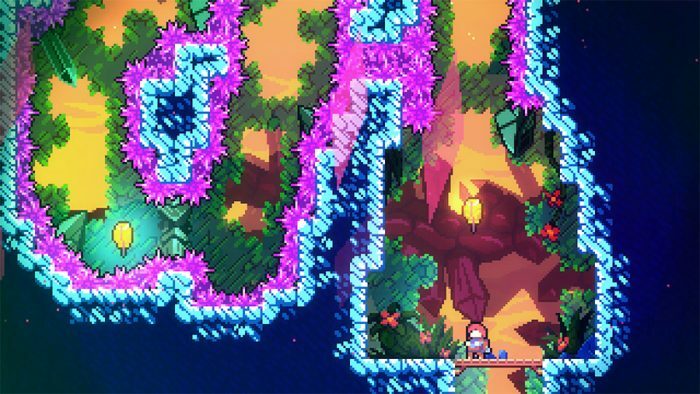 Celeste does an incredible of making us want to finish a stage. It can be brutal but worth it, because no matter the challenge the end result is always the same: we feel, and are, smarter for completing a puzzle. That little endorphin rush immediately carries over into the next objective, and starts that cycle again. And that’s all contained within an existential narrative, which is at times just as vital to the game’s charm and experience. As the story unfolds, it twists and turns along the different stages, reacting to the environment and play style by subtly confronting us with Madeline’s internal conflict and drive. This pretty little pixelated game hides a deeper reflective plot that we don’t expect until we experience it. It’s retro-sharp a on a big monitor, and perhaps even more enjoyable in the Switch’s portable mode, where we lose the external distractions of our living room and can focus in on the screen. Celeste is a blissful, yet surprisingly immersive game. Its precision twitch-controls push us to our limits, but the expert design makes us better at it just by playing. It’s still early in the year, but this gem of an indie game can already stand with any of 2018’s blockbusters. It’s available now for Switch (reviewed), PS4, Xbox One and PC. This review is based on an eShop retail code for the Nintendo Switch sent to SideQuesting by the publisher. The reviewer has played several modern puzzle-platformers.